Ok so with all this doom & gloom talk of late it has me thinking about my food storage. I figure I have enough to survive 4 months maybe longer with rationing depending on just how bad it gets, assuming it gets bad at all, I am still on the fence with all this as you all know. I have been able to restock some of my needed canned goods and I was able to get my aunt (she owns a Helath Food Store) to get me of some flour a big bag (it's in a 5 gallon pail with the lid on) although it is for a Bread Maker so if we lose power I could be SOL.. 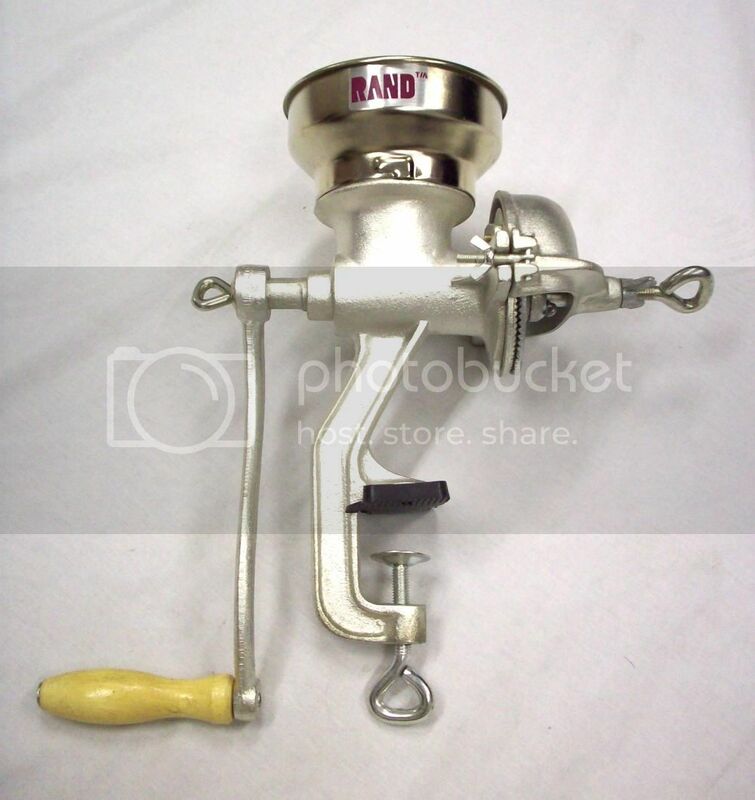 I was thinking about buying a Hand Grinder similar to the one below and buying one or two bags of wheat and possibly even a few bags of rice. My question is will the wheat and rice last a long time in a 5 gallon pail with the lid on and sealed?? Can anyone add to what I have here, I know we have done this over and over but everytime we do a new thread like this it always ends up helping someone as they forget about something. Was just checking out a few cool links and I stumbled across this deal, just bought one myslef to add an extra month to my supply, for 150 bux what do you have to lose? They claim a shelf life of 25 years so this can just sit in a dry dark corner, hopefull we NEVER need it but its nice to know its there ..
Crap! Just lost my post. Vitamins - especially children's multi-vitamins - no rickets, ya know? Coffee or Tea - don't forget that powdered coffee creamer stores a long time and makes powdered milk taste pretty good! Are you actually eating this food? For instance, do you eat the Ramen noodles for lunch? In the States, our grocery stores go on 6 week cycles. In other words, it is normally 6 weeks between sales so I try to stock up for 6 weeks at a time. Right now my stores are low, low, low. I wish I could grab a deal on canned goods like you did. Bravo! I figure I added an extra 250 lbs to my overall weight in canned goods alone. Anyways Blue I hope this better depicts my two shelving units, keep in mind this is simply a cold cellar most spices etc are upstairs in the Panrty and Round About..
Great thread, L. We can't discuss food supplies and storage too much. I have lots of rice, (in addition to 2 tubs of flour and some corn meal) and in addition to canned foods (soups, meats and fish, veggies, fruit, beans, "meals in a can" like beef stew, chili, corned beef hash, chunky soups, etc.) I have a whole 5 gallon tub of dry beans. Add cereal, including lots of oatmeal, rice cakes for me in place of bread, (I can also make tortillas with the corn meal) lots of PB&J, condiments to spice up bland food. L, I have LOTS of salt because I think it will be a much wanted item, both for people who don't have much and are sick of boring food, but as a way to preserve meat and fish. Spices will be good barter items, as will flour, rice, and sugar. I have packaged flour and sugar in 1 and 2 lb. empty coffee cans, ready for trading. However, I have already raided those, lol but I will replace them. What else??? Some candy for the kids, pop tarts, fruit snacks, little extras to help them deal with the new reality. (DS cand DIL still aren't prepping, so I have to triple what I need for just DH and me. I know I'm not going to let them starve, so I might as well have as much food as I can. And yes, we eat everything I buy (used up a lot waiting for the house to sell!) except the flour, but that is good for a LONG time. Even if it gets bugs, which I doubt it will now since it hasn't yet, we can still eat it. Just a little extra protein in the bread and pasta. What about cooking oil L2L? We buy only cold pressed olive oil. Do you have pets? We have a cool recipe for dog food, and so we stock up for that too. What about dry beans. We grow our own and have them stored in glass preserve jars. Dry stuff will last the longest. Rice keeps for years, but you have to protect against weavels! And do you have any seed stored? Never know when it may be opportune to grow stuff, but better to have some stored away in case. Luckilly we are vegetarian, so we don't have the bother with meats. Maybe we can do a check list of the top 50 things we can check against. I will ask my wife to update our list and maybe post it? I have oil stored and will be buying rice in the next week or so as well as some sort of dry beans as well. you pantry looks like my local grocery store the walk is only 1.25 Miles not far. Here's a tip for the weevils that my Grandmother passed on to me. Yep, just place one stick of gum down into flour, cornmeal, rice, dried beans - still in the wrapper. Weevils HATE the smell of spearmint and it won't make the food taste like spearmint! I have corn meal, masa harina, grits, and oatmeal stored, too. Yes, I am a child of the South and could not LIVE without my grits and corn meal. The masa harina is for tortillas and tamales. I also have salsa stored - ahhh yes - Texas ketchup! I, too, have lots of salt stored like Ruts. I have both Morton's iodized salt and kosher salt. I have sugar - white, confectioner's and brown sugar stored, too. I also have stored honey, molasses, maple syrup (cause I LOVE it) as well. Found a sale on canned veggies today - not nearly as cheap as L found but I'll take it! Found a sale on soup a couple of weeks ago and stocked up on that. I also have laundry detergent, dishwashing detergent, bath soap and bleach stored. These are the items I only purchase about every 6 weeks and I never purchase them without a coupon. I am low on spaghetti sauce, egg noodles, penne pasta and spaghetti. Used too much of it over the summer, I guess. We've also been going through orzo and couscous like crazy! It is hard for me right now because I am still trying to lose weight and the stored goods are not exactly diet friendly! I still need some Spam, vienna sausage and some other canned meats of some kind. I gave away some of the cans of stew, canned chicken, canned tuna, and canned fruit in the last food drive at work. I, too, eat what I store. Three weeks ago I only spent $52 for a whole week's worth of groceries. Today - $150 but I had $22 worth of coupons. Most Americans come over here and GRIPE about the prices inside the $2 shops about an 100g easter egg costing $5.00 Yes Americans gripe about their prices at their Checkouts maybe they should move here for a while where we DON'T have these six week saving thing that you have over there you'd come here eat for six months get FREAKED OUT that everything here costs almost 6 TIMES MORE HERE and RUN back to the states and being on an AU PENSION S*CKS $770 a FORTNIGHT that's $385 a WEEK CONVERTED INTO THE US CURRENCY THATS JUST 353.045 USD so WOULD YOU GUYS BE ABLE TO SURVIVE ON A MEASLE $353 a week with your food prices the way they are now. and you have a parent/partner who has a 2 pack a day ciggarette habit one pack of ciggarettes costs $35 a day that $70 for two PLUS YOU GOTTA PAY YOUR UTILITY BILLS ON TOP OF THAT!! shocked yet!! This venture started for us as our large dog is 11 now and started showing signs of hip dysplasia. We were feeding tinned dog food and alternating with the typical bagged dry food, yet a good brand. After some research it appeared that the processed food was the problem (sugars and poor quality ingredients) so we decided to change the diet to a more natural source. Nothing easily accessible and costing a bomb we decided to home prep their food. So now they (we have two dogs, a jack Russell and the big dog - looks like an Alsatian but she is a cross breed and red in color) have this recipe below alternated with Hills J/D's prescription diet which is high in omega oils. The task to prep two batches takes us 3 hours. Trust this helps as it also has components which can be stocked up on. Assortment of Herbs (two handfuls or about 300g) This is the most important ingredient! Cover ingredients with water and steam (pressure cook) for 10 min. and let stand for 20 min. Freeze the packets when cooled down. The herbs include: Thyme, rosemary, mint, spearmint, parsley, basil-/sacred basil, comfrey, fennel, lemon balm, nasturtium leaves and cilantro. D**n Sky that sounds good enough for a Human to eat! Cooked of course would make a NICE MEATLOAF! L2L - it works! With exercise and the new diet the big girl has better mobility and she is not in pain anymore. Very grateful for that. Depending on your dogs' taste, you can try add different veggies. I add pumpkin or squash when we have fresh from the garden. L2L - it works! With exercise and the new diet the big girl has better mobility and she is not in pain anymore. Very greatful for that. What are those brown containers with bottles inside (Your Wine Supply Pic above) for L2L? They look like distilling flasks. Bootleg? Do you mean dehydrated soup mix of some type? Thanks for the recipe! I will need to halve it for my doxies! Freak - did a quick Google search and looked at a Coles ad for this week. Do you shop there or is it a "high falutin'" as East Texas calls it grocery store? Meaning one that is really high priced? Yikes! Meat is certainly wayyyy more expensive there than here in the US. I paid $0.88 US a pound for a whole chicken yesterday. Yes, it was an advertised special and you could only purchase 2. The normal price for me is about $0.99 US a pound. Most whole chickens here weigh 2-3 pounds - these are what we call broiler/fryers. A roasting chicken weighs about 4-5 pounds and is generally a bit more expensive. The melon prices were waaayyyyy more, too! However, it is high summer where I live and melons are in season right now. Picked up a very nice canteloupe (do you have those?) for $0.88 for the whole melon yesterday. I saw an advertisement for Old El Paso soft taco kit. Seriously? I had no idea!!!! Oh and I also saw an advertisement for the exact same tika masala sauce that I buy here in Houston, TX - same manufacturer, same bottle, same everything. Peanut butter, too? I couldn't believe my eyes! I, too, struggle with what I consider to be the high cost of food. However, one huge difference between us is that the US produces most of the grain the world consumes (well, Canada, too but don't tell L ) so anything made of grain like crackers, cereal, bread, muffins, rolls are considerably cheaper here. Also, the US grows a lot of feed for cattle, chickens and pigs so meat prices are lower as well. Plus we don't have to pay import duties and shipping. Gulp! I would definitely be growing some veggies and shopping at farmer's markets if I were you. we DON'T have farmers markets here BB so we are stuck with those NASTY prices Woolworths/Sameway and Coles/Bi-lo are oh and if you think THEY ARE DEAR LOOK UP I.G.A. which is the shop down the road from me THEY ARE EVEN DEARER!!! CAN YOU TRACE MY WALKING DISTANCE!! some of these google earth pictures are a little old! It looks beautiful where you live, Freak! Let's help L2L with all those Ramen noodles! What does a cantaloupe taste like? Cantaloupe (also cantaloup, muskmelon, rockmelon or spanspek) refers to two varieties of Cucumis melo, which is a species in the family Cucurbitaceae, which includes nearly all melons and squashes. Cantaloupes range in size from 0.5 kg to 5.0 kg. Originally, cantaloupe referred only to the non-netted orange-fleshed melons of Europe; however, in more recent usage it has come to mean any orange-fleshed melon. The North American cantaloupe, common in the United States, Mexico, and in some parts of Canada, is Cucumis melo reticulatus (or sometimes C. melo var. cantalupensis), a different member of the same muskmelon species. It is named reticulatus because of its net-like (or reticulated) skin covering. It is a round melon with firm, orange, moderately sweet flesh and a thin reticulated light-brown rind. Varieties with redder and yellower flesh exist but are not common in the U.S market. Oh you meen Rockmelons sure we have those! I Like adding sugar to them or Honey anyone does the trick makes them extra tasty!